Visitors wearing 3D glasses follow Jimmy Fallon on board a “flying theater” that zooms you around famous New York City landmarks aboard a souped-up go-kart he refers to as “The Tonight Rider.” In Pre-show activities let guests interact with Hashtag the Panda, listen to The Ragtime Gals and send their very own Thank You Note….check out grand opening! 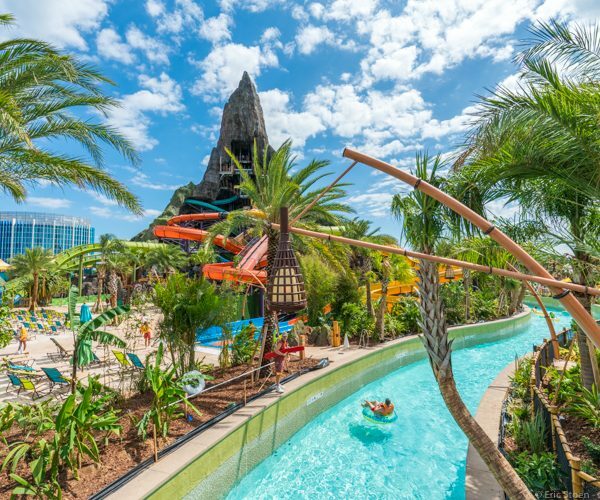 Universal Orlando Resort’s third theme park features Krakatau—the fire and water volcano—that looks over this water playground full of thrills and relaxation. The park features all kinds of water rides, from slides to wave pools and rafting adventures to smaller places for your tadpoles. Don’t worry about long lines or having to carry tubes around. Volcano Bay’s unique TapuTapu wearable takes care of those hassles….check out grand opening! A re-imagining of the park’s long-running Macy’s Holiday Parade, this extravaganza will feature Dreamworks favorites such as the Minions, Shrek and Madagascar. Yes, Santa will be there as well. Brand new balloons will also premiere!…coming soon! Christmas is coming to Hogsmeade and Diagon Alley. The holiday season will be celebrated on both sides of the Wizarding World of Harry Potter at Universal Orlando theme parks this year. At Islands of Adventure, the new experiences include special effects projected onto Hogwarts castle featuring Christmas moments from J.K. Rowling’s series about the boy wizard. The highlight of Christmastime at the Wizarding World of Harry Potter will be a holiday show taking place on Hogwarts Castle. This new experience will use mapped-projection technology to “cast a spell” onto the castle and feature iconic moments from the films….coming soon!